The sinking of the Russian navy’s biggest dry dock could spell trouble, and change, for the world’s third-biggest navy. PD-50, a huge floating dry dock at the 82nd Repair Shipyard in Roslyakovo, Russia, accidentally sank on Oct. 29, 2018 after an electrical malfunction resulting in pumps overfilling the dock’s ballast tanks. Four shipyard workers were hurt. Admiral Kuznetsov, Russia’s sole aircraft carrier, was aboard PD-50 at the time of the sinking. The carrier remained afloat but suffered damage from a collapsing crane. It could take years for the Kremlin to make up for PD-50’s loss. In the meantime, the Russian fleet will lack a floating repair facility for the 60,000-ton-displacement Kuznetsov and potentially other large warships of Cold War-vintage. Dry docks lift ships out of the water, allowing workers to access their lower hulls for deep maintenance. Even before PD-50’s sinking, the Russian fleet was slowly replacing big, old ships with much smaller new ones that can’t sail as far or carry as much weaponry, but which are cheaper and easier to operate and repair than the old vessels are. The Kremlin bought four new, small warships in 2018. 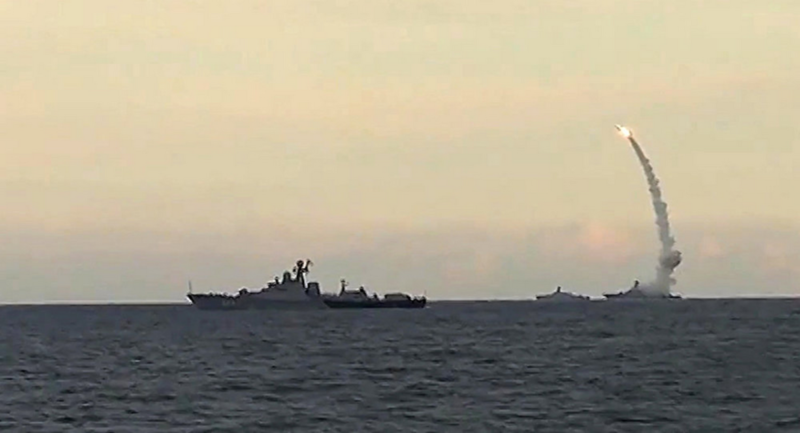 The Russian fleet numbers some 300 vessels, most of them displacing just a few thousand tons of water. For comparison, the U.S. Navy has roughly the same number of ships, but they are, on average, much larger. Before, Moscow planned on extending the service lives of its carrier and other warships from the 1980s in order to complement the newer vessels. For long-range deployments across the Atlantic or to war zones such as Syria, Russia tends to send Kuznetsov and equally aged, Soviet-built destroyer and cruisers. Newer corvettes, which are a fraction of the size of a Cold War cruiser, have tended to remain close to home. In recent years, corvettes from the Caspian Sea fleet have fired long-range Kalibr cruise missiles at targets in Syria — all without ever leaving Russian waters. A shortage of accessible dry docks for repairing bigger ships complicates the Kremlin’s naval planning. In that way, PD-50’s sinking could accelerate the Russian fleet’s existing transformation. “It is probably unlikely to force any radical changes,” said Pavel Podvig, an independent expert on the Russian military. The Russian navy was already becoming a “green-water” force optimized for near-shore missions in support of ground operations along Russia’s periphery, as opposed to a “blue-water” force like the U.S. and Chinese navies are. Without PD-50, the Russian navy could become a green-water fleet even faster, forcing the Kremlin to reconsider its overall naval ambitions. “In many ways, this reinforces the view that Russia’s naval future is not that of major power-projector, but rather significant harassment force,” said Eric Wertheim, author of Combat Fleets of the World. As of early November 2018, the 1,080-feet-long PD-50 lay at the bottom of the Kola Bay in northern Russia. Deputy Prime Minister Yuri Borisov said a commission would consider the navy’s options for fixing or replacing dock. Asked if the navy might raise and repair PD-50, Borisov said “the ‘yes’ answer is more likely than ‘no. '” It could take six months just to refloat the dock, according to state media. Refurbishment could take months or years of additional work. Russian officials have downplayed PD-50’s loss. “We have alternatives actually for all the ships except for Admiral Kuznetsov,” Alexei Rakhmanov, head of the United Shipbuilding Corporation, told state media. That alone is a big problem for a fleet with just one carrier. “It’s not clear what will happen to Kuznetsov now,” Podvig said. Moreover, many of Russia’s other, smaller dry docks are thousands of miles from the fleet’s main northern bases. Moving the docks, or the ships needing repair, could be difficult, expensive and time-consuming. For the most part, the yards and design bureaus that produced the Cold War fleet still exist, even if they are a bit dilapidated and under-staffed. Russia could, in theory, build a new dry dock or buy one from a European or Asian builder. Likewise, the country could design and build new, large warships to replace the older, maintenance-intensive vessels. The main problem is money. The Kremlin was already struggling with the cost of modernizing its fleet even before PD-50 sank. “It remains unclear whether Russia’s economy will be able to sustain more than a short-term, piecemeal modernization long into the future,” Wertheim said. The Russian government might have to choose. It could spend potentially tens of millions of dollars raising and repairing PD-50, all in order to repair some 30-year-old ships for a few more years of service. Or it could decommission those ships and replace them with new, smaller vessels. Given those naval options, Moscow might turn its back on the past and look to the future.